On my last evening in Iceland I decided to drive back to the small town of Vik and the nearby coastal area of Kirkjufjara where there are a number of sea stacks, black sand beaches and other interesting basalt rock formations. I had first visited this location on one of my first days in Iceland with the group I was travelling with; but we had been there during the middle of the day when the light was less than ideal. As Vik was on the way back to Reykjavik and the airport it provided a good opportunity for one last evenings shoot before leaving Iceland. As it turned out and much like the first visit the wind was blowing a gale as I drove along the rocky track into Kirkjufjara. I had the entire location to myself bar a couple of cyclists struggling against the ferocious headwind on the way back to the main road. I am not sure what it is with cyclists in Iceland – but they seem hell bent on riding no matter what the prevailing weather conditions. With the strong on-shore winds there was a huge amount of sea spray in the air; which made keeping the front element of the lens and filter clean rather difficult. However, it was worth persevering and as the sun began to set the combination of sea spray and golden light provided a good opportunity for some photography on my last night in Iceland. 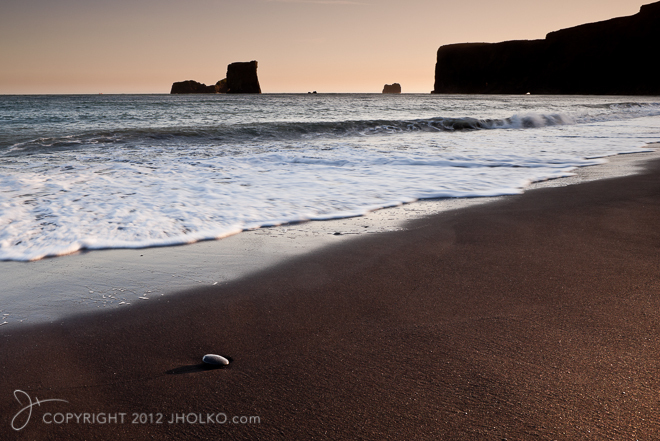 A higher resolution version is on my Portfolio website under Iceland. Prints are available upon request.